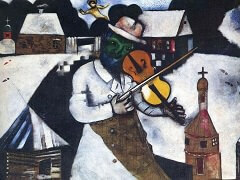 In his biography of Chagall, Franz Meyer quotes an aphorism that sums up the two artists: "Pablo Picasso stood for the triumph of the intellect, Chagall for the glory of the heart." The two now established a relaxed friendship. 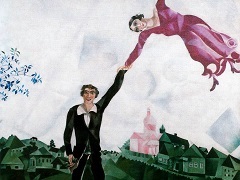 The love poetry written by Chagall in such works, and the tender elation (which matched his own emotional situation), peaks in Lovers in the Lilacs, painted in 1930. 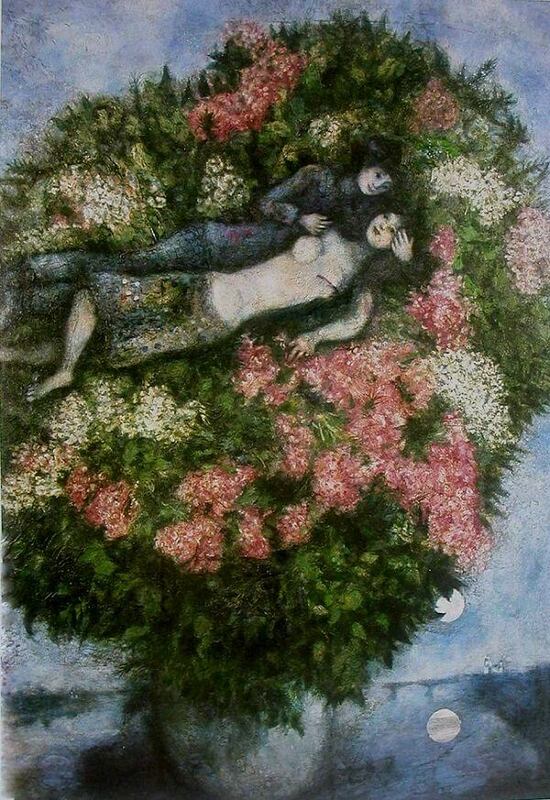 The couple, idyllically bedded down in a giant bouquet, are wholly immersed in the timelessness of love. Following an ages-old pictorial code, Chagall has here incorporated two of his central motifs: an icon showing the Madonna Platytera was his inspiration, a representation of the pregnant Virgin Mary with the child painted on her belly for clarity's sake. 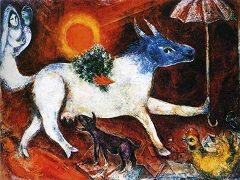 In painting the mare with the foal in her womb, Chagall had already echoed this treatment; now he abstracted it into an explanation of the symbolic dimension that was always in his motifs. 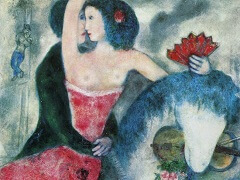 Without doubt, this approach simplified the business of decoding his pictorial messages, and helped Chagall to the popularity his work enjoyed at the time, but at the same time the wish to be comprehensible lent the paintings a touch of Romanticism that seemed somewhat out-of-date. 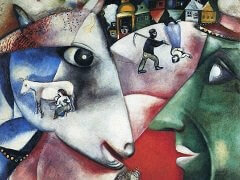 Yet, that first decade in Paris, as the artist tells us, was "the happiest time of my life". A contract with the art dealer Bernheim removed his financial worries, the family was able to move into a villa, and soon they were taking their summer holidays in the south of France for granted. 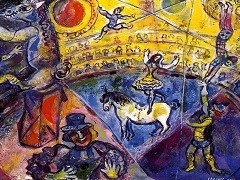 This more lavish way of life, this private happiness, was accompanied by a compulsive turn to the opulent in Chagall's work: the carefree naivety of the pictures reflects the painter's own untroubled existence, and the magical atmosphere replaces that liveliness of subject matter which requires an eventful reality as a corrective.